My first ever parent-free overseas visit was, like most English schoolkids, a day trip to Boulogne. This included the obligatory visit to Auchan which, thinking back, was more for the teacher's sanity than the kid's education! How influential that trip was - so much so that I still remember exactly what I brought back: 4 different cheeses, the stone pot of grain mustard and a crepe pan. I fell in love with the array of pans, coffee filters and implements that greeted me in aisle after aisle in this enormous supermarket. This was heaven beyond my wildest 11 year old dreams. But what to buy? I settled on a crepe pan as it was the cheapest non-stick pan in the store. Non-stick was aspired-to but untested in our household. I relished the thought of arriving home and presenting my mum with this new modern pan in which we would create paper-thin lacey crepes flambeed with brandy, instead of our more familiar thicker pancakes rolled up with a sprinkling of Jif lemon juice and granulated sugar. The dream didn't quite materialise but Mum put the pan to great use frying eggs. and also returned with a pan. This was most out-of-character for him, but the reason soon emerged. Where I was critical of Mum's pancake making skills, Ian was aiming straight at the heart of her omelettes. Apparently Mum's omelettes were just wrong. Actually, if Mum was wrong then so was Julia Child. But according to Ian, omelettes should be aerated and fluffy and - sin of sins to European kitchens - dry! To help produce these 3" high fluffy wonders, Ian presented another non-stick pan completely alien and exotic to our eyes. Icing (powdered) sugar to dust. Preheat oven to 200 deg C (400 deg F). Set the butter to melt in a non-stick fryingpan over a low heat. Whisk to combine all ingredients - except icing sugar - in a bowl. When the butter has foamed, pour in the batter and tilt to spread around pan evenly. Cook gently until the edges begin to set. Transfer pan to oven for 10-15 mins. Tart is ready when the mix is set in the centre. Take out of oven and place under a hot grill for 1 minute to brown the top, then dust with icing sugar and serve. This is one of the quickest and easiest desserts you can make, so it is seriously useful to have up your sleeve in case of unexpected guests. Mark's recipe states this would serve 4, in my house it would serve 6 and at a pinch 8, but maybe this is about UK v. US portions. Zest the lemon but omit the lemon juice. Set the oven on and melt the butter as above. Separate the eggs and whisk the whites and salt on a food mixer till firm peaks achieved (get a spoon full and scoop a bit out - the egg whites should hold their shape on the spoon). Gradually tip in the sugar whilst the whites are still whisking. 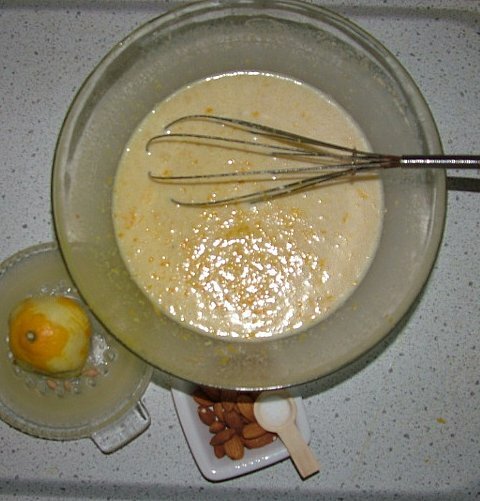 Mix the lemon zest into the egg yolks and the cream, tip gradually but quickly into the whisking whites mix. As soon as the liquid is combined, stop the mixer and remove the whisk. 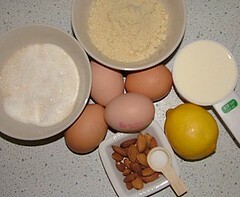 Gently fold the ground almonds into the sloppy egg mixture then pour it all into the warm frying pan. Finish as per method above. 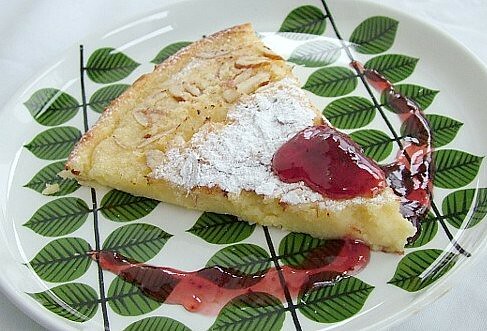 This should give you a tart with more lift which will look that bit more impressive, if you find the need to impress your guests! Serve with a drizzle of blackberry coulis (or another strong fruit, as the tart contains less lemon now) and a homemade shortbread.